The Destination: LEADERSHIP campaign launched in fall of 2016 with a $3 million fundraising goal to secure the purchase and renovations of approximately 10,000 square feet of office space for the Center’s new home at 707 West Main Street. Need to make a pledge payment? D.D. Williamson & Co, Inc. The Center’s search for a new location began in January 2016 with goals to have great visibility, easy access for members and open and collaborative meeting and classroom space for members and staff. 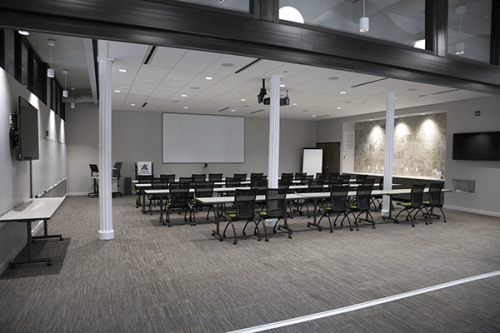 After months of evaluation, 707 West Main Street, which is a two-story office condominium unit containing 10,000 square feet located in a historic building, was determined to be the best fit for the organization. It is a rare opportunity to find space on a prime corner of the downtown with street-level presence, windows on three sides with views of the Ohio River and Fort Nelson Park, access to green space for outdoor training sessions and close proximity to hotels and after-hours activities for out-of-town participants. Partners on the renovation project include Miranda Construction, Swope Design and K. Norman Berry & Associates. On March 27, 2018, at the Grand Opening celebration, the Center was dedicated to the leadership legacy of Bill Street, former president of Brown-Forman Corporation and long-time supporter of Leadership Louisville. A highlight of the new facility is the Ed Glasscock Leadership Development Classroom, which features natural light, modern technology and unique glass architectural features, and will host all future Leadership Green Room courses. Additionally, the PNC Alumni Lounge includes gathering and café space with views of the Ohio River. Sandra Frazier received kudos from the campaign steering committee and was recognized with the naming of the executive conference room. Phase two of the project will reclaim an overlooked and underutilized green space behind the building to create a new park plaza. The design for the space is inspired by the award winning High Line park in New York. Why invest in community leadership? 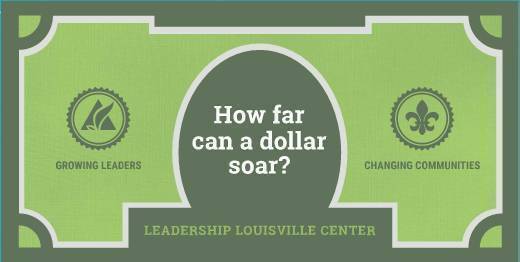 Click on the dollar below to launch our infographic. You’ll see fellow civic leaders and maybe even your own organization in these true stories of community impact and connections.